So You Think You Can Dance’s results show was a stunner. On several occasions it seemed a number of dancers were shocked to the point of confusion as the results were announced. So You Think You Can Dance perennial bottom-three dweller Caitlin fully expected to land in the bottom three after the alien mating dance she did with Jason but it was not to be. The expression on her face when she was told they were safe was priceless. It looked like she was afraid she’d heard it wrong, something I worry about every Thursday night. Cat Deeley mixes up how she announces the bottom three, so there are times when I’m not sure if the name she called is the winner or loser. I wish the show would tighten up on that. Later, Kupono and Vitolio stood side by side after Philip was saved by the So You Think You Can Dance judges. The judges called Vitolio to the front and Kupono stepped forward. I think they were both expecting to go home having been in the bottom so many times before. It was Vitolio who was cut loose for the guys and Karla for the girls. I’m sorry to say that I can’t even picture Karla’s face as I write this and that’s not a good thing. These dancers need to be memorable if they want to win the final prize. Over at She’s Got the Look, memorable wasn’t the problem for the models only it wasn’t in a good way. The women were paired off to form works of living art for a gallery-style fashion show. I was amazed to here the women complaining about the clothing right from the start. These gowns were gorgeous, real works of art, and they acted as if they’d been asked to wear flour sacks with clown faces on them. Mortal enemies Leanne and Shelly were paired up and you gotta give Leanne props for trying to work through it but Shelly wasn’t having any. She literally pushed and pulled her partner around on the stage and it was all very uncomfortable to watch. Incredibly, neither was sent home. It was Sandy who was sent packing. Guess Leanne and Shelly are too good for the ratings to boot this early in the game. Can’t get out and watch fireworks? Watch them on TV. 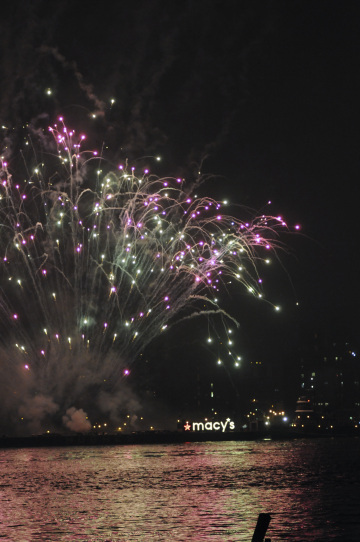 NBC will have the Macy’s Fourth of July Fireworks Spectacular. Jewel is performing as is the cast of West Side Story. CBS will be broadcasting the Boston Pops Fireworks Spectacular. Your local PBS station should have A Capitol Fourth, which includes the National Symphony Orchestra, guests such as Aretha Franklin and Barry Manilow and fireworks from Washington DC. SCI FI Channel has Twilight Zone all weekend. USA is going with a James Bond Movie Marathon. TCM has holiday themed films all weekend. WE TV has a Golden Girls marathon. Food Network is airing a run of Chopped. BET is going with the sitcom Sister, Sister. Chiller is airing the spooky teen soap Point Pleasant. Ugly Betty’s Vanessa Williams exclusive interview!